Nashville, TN – With the recent passing of Bobby Keys, the last of the legendary rock sax players still remains – Phil Kenzie! Phil has the great distinction of playing sax on The Beatles legendary ‘Let It Be’ album! Along with The Beatles, Phil’s impressive resume includes recording sessions and tours with such iconic music groups and artists as John Lennon, George Harrison, Paul McCartney, Black Sabbath, David Bowie, Rod Stewart, The Eagles and many others. It’s easy to be familiar with Phil Kenzie’s superb sax work. Just recall the soaring solos on Al Stewart’s “Year of the Cat” or “Time Passages” still enjoying favored airplay to this day, or the punchy brass intro to “Jet” by Paul McCartney, or the inspired solo on “The Long Run” from “The Eagles Live” album. In fact, this gifted sax player/arranger has lent his masterful touch to hits by everyone from Rod Stewart to Jackson Browne, Stevie Nicks and Rosanne Cash to David Bowie, and in the process amassed some nineteen gold and platinum albums! Phil also holds the world record for the highest note ever played on Alto Sax on a solo on a top ten hit record (entry note on the first solo on “Time Passages” by Al Stewart). A documentary of Phil’s incredible musical journey is in progress and is 99% finished. With 120 minutes in length, it is produced by Harry Jarvis an Independent video producer from Nashville TN. Phil relates, “I’m originally from the Liverpool area in England and in my first band, The Pressmen, I played many of the clubs made legendary by The Beatles, even occasionally sharing billing with the ‘Fab Four’, including The Cavern and Hamburg’s famous Star Club. So it was totally appropriate that I should be asked later to play on the most classic ‘swan song’ of the century, ‘Let It Be’. This connection continued with my work on recordings for Apple Records, most notably John and Yoko’s ‘Plastic Ono Band’ at Lennon’s home in Ascot and all of the horn section work and solos on George Harrison’s ‘All Things Must Pass’ and playing in the massive sax section on ‘Jet’ for Paul McCartney and Wings. Through these sessions, I also worked with such notable stars as Eric Clapton, Steven Stills, Peter Frampton, Delaney & Bonnie, Leon Russell, Doris Troy and Billy Preston. Now, much to the excitement of his fans worldwide, Phil is releasing a CD titled ‘A Night With The Cat’. The album, recorded between 1998 and 2008, has never been released before and is an instrumental depiction of the lyrics/story of “The Year Of The Cat” hit single by Al Stewart, in which Phil plays the world acclaimed hit saxophone solo. Titles on Phil’s new CD reflect the lyrics of the song. Phil is backed on ‘A Night With The Cat’ by Peter White “king of the soft jazz charts”and legendary session players Bob Babbitt and Larry Knechtal. 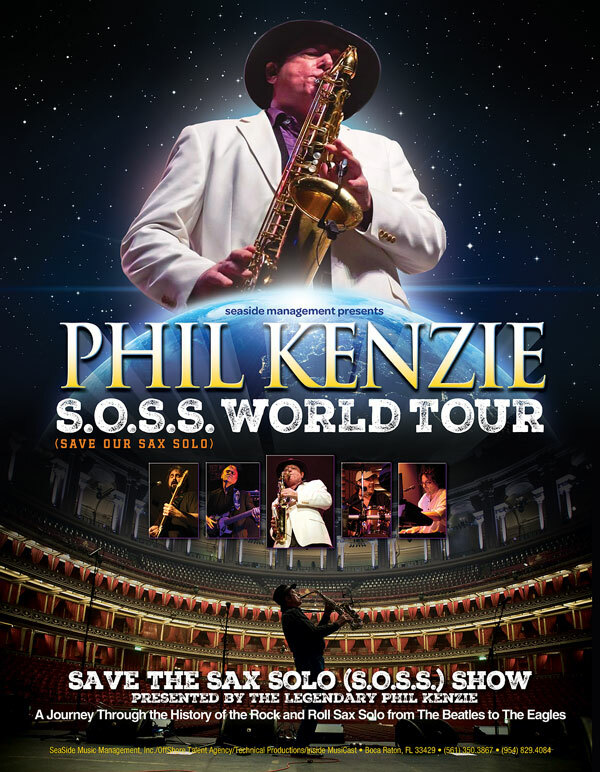 In support of his new CD release, plans for Phil’s S.O.S.S (Save Our Sax Solo) tour is currently in the works. The show will premier at Jazziz Nightlife on Jan 15th, 2015 in Boca Raton, Florida. Considered one of the greatest rock ‘n; roll sax players of all time, Phil Kenzie has worked with The Eagles, Rod Stewart, Graham Nash, David Crosby, Rodney Crowell, Roseanne Cash, Brian Wilson, Vince Gill, Stevie Nicks, Jackson Browne, Karla Bonoff, America, Boy George, Carly Simon, Randy Meisner, Steven Stills, Poco, The Pointer Sisters, Kenny Loggins, Tom Petty, Ronnie Spector, David Lyndley Eric Carmen and Debbie Gibson etc. At his latest sell out concert appearance with Al Stewart at The Royal Albert Hall on October 15, 2013, Phil received a standing ovation from a more than 6000 strong audience. Also, The Eagles have recently posted two songs on their official website featuring sax solos by Phil! This entry was posted on Friday, January 2nd, 2015 at 18:17	and posted in Phil Kenzie, Press Release. You can follow any responses to this entry through the RSS 2.0 feed. « Cleopatra Records Signs Alternative Folk Rock Heroes 10,000 Maniacs!